Barcelona's Pedro has described his situation as "difficult" after the club's technical secretary said he wants to leave the Spanish champions. The Spain forward, 28, has been linked with Manchester United and came off the bench to decide Tuesday's thrilling 5-4 Super Cup win over Sevilla. Before the game, Robert Fernandez said: "Pedro has told me he wants to go." Afterwards, Pedro said he had a "lot of anger" at not starting and called Fernandez's comment "very unfortunate". "I've not said what Robert's said, or at least not how I said it," Pedro told a Spanish broadcaster. A product of the Barcelona youth system, Pedro has scored 99 goals in 319 games for Barcelona and won five La Liga titles with the Nou Camp club. He made 50 appearances last season and has won the Champions League three times, including scoring a goal in the 2011 final against Manchester United. He has also played a part in Spain's World Cup and European Championship triumphs. Asked if he wanted to leave Barcelona, Pedro said on Tuesday: "The answer is no. But it is a difficult, complicated situation. When you know you may leave, it is difficult." He said the issue around his future was "not for money" but about "minutes" on the pitch. "The truth is that I had a good chance to play [in the Super Cup]. The coach has decided not to count on me. I don't know, I don't know if I will continue here," he added. Manchester United are looking to replace Argentina winger Angel Di Maria, who has joined French champions Paris St-Germain for £44.3m. "Manchester? Yes, there are nice challenges on all sides," Pedro said. "Today I'm here, and I'm happy. And if I go, I will go with my head held high having always given everything." Lionel Messi, scorer of two goals against Sevilla, said: "The players and the club don't know what he is going to do. It is his decision, but whatever he does we wish him the best." Messi's fellow Argentina international Javier Mascherano added: "Hopefully he can continue here. He is one of those players that is made for the big moments. He has that touch where he delivers at the vital point." Spain midfielder Sergio Busquets said: "He is a player who has helped a lot, that deserves it. Who, as he said himself, doesn't get all the minutes that he would like - and I think he deserves. "But, this is football and I wish him all the best either here or wherever he wants. He has said he doesn't want to leave but well, in the end all us players want to play and we will see what happens." However, Pedro has been warned about a move to United, with former striker Hristo Stoichkov criticising their manager Louis van Gaal and saying he would "no longer be a footballer" at Old Trafford. 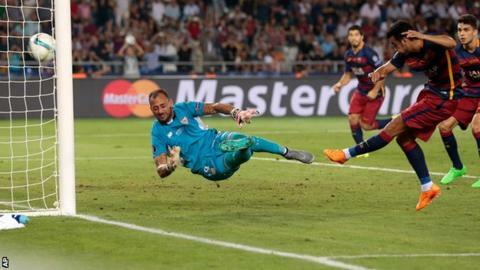 The Bulgarian said: "Pedro is a symbol of Barcelona, a type of player with energy, he fights to make himself great. Why do Barcelona need to sell him? "I'd never be under the orders of Louis van Gaal. He destroys clubs, he did it with Barcelona, and after they take years to build."